The time has come for actually buying materials for our patio retaining wall. We are jumping for joy! As we mentioned here, we set out to a local stoneyard to look at materials for the job. We looked at a couple of different stoneyards and settled on Norristown Brick as our favorite spot. (Just to set the record straight, they do not give us any bennies for mentioning their name on the blog, we just like them and want to share our experiences with you too.) We also checked out Home Depot and a stoneyard in Phoenixville, PA, but Norristown Brick’s customer service was unprecedented. Plus, we love to support local businesses whenever we can. Let’s back up and talk about what we were looking for. We had outlined a number of options for what materials we would use on the wall and then we looked at the pros and cons of each. Mortared stone, like the existing wall – The biggest pro for this option is that it would be a seamless extension of the existing wall, hopefully looking like it had been there forever. The biggest con for this option was that we couldn’t find matching stone and we thought that putting the wall together was going to be difficult. Cement block with stone veneer – This would unquestionably have been the strongest option and would’ve been an easier way to get the same look as the old wall. A cement block wall would’ve lasted a long time, but we were concerned about the stone veneer. A lot of water would likely get into the cement block and we expected that the stone veneer would break off. Oh, and we discovered early on that this would have been a very expensive option – the cement block alone would have been pricier than most of our other options and we would still have to pay for the other materials on top of that. A wall system (e.g. EP Henry) – We expected this to be the easiest and least expensive option. Our primary concern was whether we could find a system that complemented our existing wall. We also weren’t sure how strong the wall would be. With those options in mind, we drove over to Norristown Brick to see how the different products looked in person. We brought a couple photos of our existing wall so we could get advice from the pros on a good match. We quickly eliminated mortared stone from our list (we couldn’t find the right type of stone at any local stoneyards and it was going to be too difficult to build) and cement block with a stone veneer (too expensive and too likely to have long-term problems from water). We were pleasantly surprised by how much we liked the EP Henry wall systems. The rep also suggested that we consider stacked stone for the wall. She told us that the stacked stone was in the same price range but might be more in line with the old wall, stylistically speaking. A wall system (e.g. EP Henry) – After looking at the options at the stoneyard, we decided we really liked the look of the Diamond Pro blocks in a color called “Dakota.” Since these were also the cheapest blocks available and they were nice and big (read: faster to install), we were pretty psyched about them. We got estimates on both options and both options were comparable in price. We decided to be logical about our decision. We figured that if we liked the Diamond Pro blocks (in the middle of the picture below), that we should go with those since they were cheapesst and easiest. To give the wall a unified look, we planned to cap the wall with flagstone like the existing wall. The next step was to dig a trench for the wall. SPOILER: This is when the plan to use the Diamond Pro blocks totally fell apart. So, trench digging time had come, and we ran back to Norristown Brick to pick up a couple Diamond Pro blocks to use as a guide while we dig our trench. We discovered (1) that the blocks required a trench about a foot deep (too.much.digging) and, even worse, (2) the blocks looked terrible in our backyard (oops, sorry, we were too busy with frustration to take pictures). Instead of digging, we set out to look at other wall systems. Norristown Brick was closed for the weekend, so we went by the stoneyard in Phoenixville that offered longer hours (and remembered why we love Norristown Brick). The only ones we thought would work in our backyard, after seeing the Diamond Pro blocks back there, required a “geogrid” be placed behind them when building 4 feet tall. Installing a geogrid meant lots more digging, so we ruled that out. Oh, and we also didn’t like the fact that the wall systems that looked prettier cost a small fortune. Back to the drawing board. We reevaluated the viability of a stacked stone wall, since that was on our short list. Some research revealed that stacked stone was actually pretty strong when you added an “invisible” mortar (i.e. a mortar in the back of the stones that you can’t see from the front of the wall). 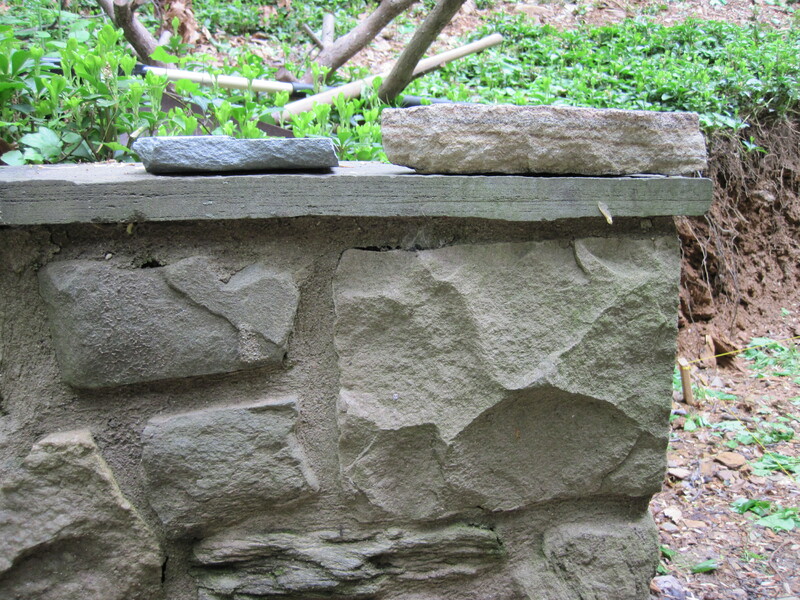 Not to mention that stacked stone was reasonably priced and would allow water to drain well. We knew it was meant to be one night when we were out for a walk and realized that almost every house in our neighborhood features a stacked stone wall. Our house is one of only a few without that feature… but not for long! Once we got home and stuck them in the backyard, we knew we made a better choice. The Diamond Pro blocks looked too much like a plain cement block and was too modern for our rustic yard. We’re hoping to get that 75-foot trench under construction in the next week or two. Then we’ll finally get to see the wall come to light!